I designed this little flower as an ornament for a Christmas parcel, at a friend's request. I liked it enough to submit it to SlipKnot, the journal of the Knitting and Crochet Guild. You could also use it as an embellishment on a hat, bag, cushion etc, or attach a hair-slide or brooch pin to the back. It also works pretty well as a pen topper, but you may need a dab of glue to help it stay in place, depending on your gauge. 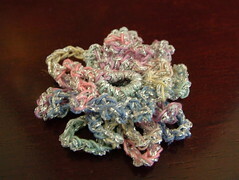 It's worked by crocheting twice into the same round - once into the front loops, then back round again into the back loops. You can create a bigger flower if you wish, by adding 4ch to the loops of each extra odd-numbered round, but the back of the flower does become quite thick, quite quickly. Use any thread or yarn and an appropriately-sized hook to the yarn or thread you use. The size of the decoration will vary with the size of the fibre used. For the example illustrated (about 2"/5cm diameter), I used a size 10 crochet thread held together with a strand of Twilley’s Goldfingering in Silver, worked with a 4mm (G) hook. Round 6: Rpt row 4. Fasten off and sew in ends. Ease petals into shape. I like your daisy, daisy flower, especially the yarn colours you used!